This article is about the ecclesiastical province in England. For the former civil province in New Zealand, see Canterbury Province. For the current administrative region in New Zealand, see Canterbury Region. For other uses, see Canterbury (disambiguation). The Province of Canterbury, or less formally the Southern Province, is one of two ecclesiastical provinces which constitute the Church of England. 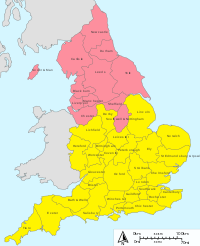 The other is the Province of York (which consists of 12 dioceses). It consists of 30 dioceses, covering roughly two-thirds of England, parts of Wales, and the Channel Islands, with the remainder comprising continental Europe (under the jurisdiction of the Diocese of Gibraltar in Europe). Between the years 787 and 803, a third province, (of) Lichfield, existed. In 1871, the Church of Ireland became autonomous. The Church in Wales was disestablished in 1920 and therefore was no longer the state church; it consists of six dioceses and is an ecclesiastical province of the Anglican Communion. The province's metropolitan bishop is the Archbishop of Canterbury who also oversees the Falkland Islands, an extraprovincial parish. The Church of Ceylon - Anglican Church in Sri Lanka has two dioceses - the Diocese of Colombo and the Diocese of Kurunegala which are extraprovincial dioceses under the jurisdiction of the Archbishop of Canterbury. Bishops of the southern province meet in chapter, in which the episcopal roles (those of Bishops) are analogous to those within a Cathedral chapter. In the 19th century, Edward White Benson, Archbishop of Canterbury, discussed with the Bishop of Winchester and others the role of the Bishop of Winchester within the Chapter. Lambeth Palace librarian Samuel Kershaw uncovered documents in which the Bishop of Winchester was Sub-Dean and the Bishop of Lincoln Chancellor, and others in which Winchester was Chancellor and Lincoln Vice-Chancellor. Benson ruled that the Bishop of Winchester would be Chancellor of the province and additionally Sub-Dean only during a vacancy in the see of London (Dean of the province). Bishop of Rochester – Crucifer (Cross-Bearer). Accordingly, at the confirmation ceremony following Justin Welby's election as Archbishop of Canterbury on 4 February 2013, these were, respectively: Richard Chartres, Tim Dakin, Christopher Lowson, Nick Holtam, John Inge and James Langstaff. The Bishops of London and Winchester join the Archbishop and two from the northern province of England (York and Durham) in having ex officio (meaning by virtue of the office they hold, hence automatically) the right to sit in the House of Lords subject to keeping to certain constitutional conventions incumbent on Lords Spiritual requiring them to speak in an albeit often political, but clearly non-partisan manner, and not to participate in most party-whipped votes. Twenty-one other Church of England diocesan bishops (who have served the longest) form the other Lords Spiritual in the House of Lords. ^ a b c Cross & Livingstone 2005, p. 284, Canterbury. ^ Kemp 1961, p. 249. ^ Cross & Livingstone 2005, p. 1785, Winchester. ^ Cross & Livingstone 2005, p. 985, Lichfield. Kemp, Eric Waldram (1961). Counsel and Consent: Aspects of the Government of the Church as Exemplified in the History of the English Provincial Synods. S.P.C.K.